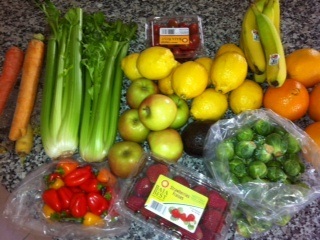 Over the years I have learned some specific ways to save on fruits and vegetables. And I have a new deeper interest in saving on fruits and vegetables this year because I was blessed by Mr. Cameraman at Christmas with a Vitamix !! I really wanted a Vitamix and it was such a surprise to receive it. But we are really REALLY going through the produce right now. Don’t miss the weekly produce cash back deal for sure! First, would you agree the very best and most flavorful produce is when the fresh vegetable or fruit is in season? I sure hope you do! It only stands to reason if the produce is in season it’s at its peak flavor and it’s bounty the cost will be lower. It’s supply and demand! Celery, potatoes and bananas have pretty consistent pricing all year long. My seasonal produce list may be slightly different in your climate. Some produce will be seasonally for a few months, try some new recipes and enjoy! Print this list for future reference. Go as far as making notes of the last price you paid for the produce and try to beat that price.